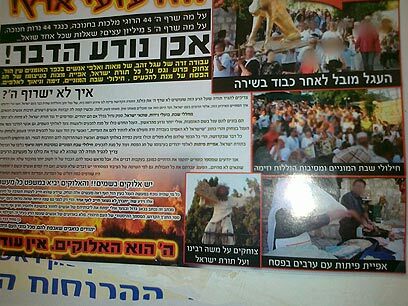 For a few days now, the colorful poster claiming that the Carmel fire took place due, among other things, to the "golden calf ceremony" held in Ein Hod and the fact that the towns in the Carmel region "bake pita bread over the Passover holiday" has been hanging at the entrance to the Religious Council building in Holon, an institution which is kept thanks to public funding. "Why did the country burn?" the heading on the poster read while colorful pictures underneath it detailed the reasons for the fire that claimed the lives of 44 people. "Idolatry of the golden calf, by hundreds and thousands in the artists' village of Ein Hod, turning the entire torah of Israel into a joke, baking pita bread during the Passover holiday out of spite, massive desecration of the Sabbath, debauchery and adultery by the thousands; how could God not burn the region?" The poster includes a picture of a golden calf, put on display during an art festival held at the artists' village damaged by the fire. Another picture is that of a woman with a veil and blurred face, making a Druze pita with a caption that reads: "Baking pitas with Arabs during Passover". Ein Hod residents weren't concerned over the poster, one of the residents noting cynically: "Our neighbors from the religious town of Nir Etzion heard the claims too and asked, never mind you sinners, but what did the orphans in Yemin Orde do?"